I have been thinking about my friends lately. Don’t get me wrong. I think of them all the time but just a bit more lately. I miss seeing them. 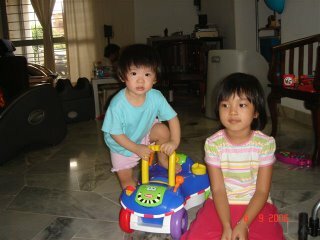 I miss the time we used to spend together while growing up in Ipoh. The boy-crazy days. The fashion-conscious days when we pored over the dog-eared Seventeen magazines at one of the girls’ house. Never mind that the magazines were old issues. We would snuggle in her air-conditioned bedroom and chat about just anything under the sun. We laughed and cried together. We learned how to put on the makeup, how to do our hair, etc. So much fun. I also remember cycling all over Ipoh Garden with some girlfriends. Once we were at another girlfriend’s house and peeped at the boys who passed by. The boys threw stink bomb onto the porch and we retaliated by spraying water on them. After that we quickly ran back to the house and collapsed on the floor, laughing so hard at the silly antics. At one point of my life, I was really sad because my boyfriend (now hubby) had to migrate to Toronto with his family. I was crying every day and had to resort to taking sleeping pills so that I could sleep at night. All my good friends came to comfort and advice me. They let me cried on their shoulders and listened to my sob stories over and over again. Those who could not visit me would call up to comfort me. The good old days. We still keep in touch with each other eventhough some of us are in different cities and countries. Our friendships go way back to primary school. Eventhough we do not call each every day, every week or even every month, there is no barrier between us. We would still chat like the old days. There is a friend who would call me once a week or once every two weeks to see how I am doing as she knows that I may be stressed from taking care of my munchkin 24/7. I do feel bad as I don’t call her as much as she calls me. She is the person I would go to for advice when I run out of ideas on what to do when munchkin is sick, what to feed her, etc. Since both of us are shopaholics, she would also inform me of any good bargains and vice versa. A friend who lives in another city would also call me once in a while to see how I am doing. Always so thoughtful and full of concern. I am glad to have friends like them. Friends that you can count on, come rain or shine. My life is so much richer because of them. Ashley’s cousin, Kulnita is staying with us for a few days with Mah Mah. Needless to say, Ashley is so happy to have someone to play with. However, her 6 years old cousin is not too thrilled as Ashley kept pinching her and pull her hair. She thinks it’s fun eventhough we kept telling her not to do it. Hope this is just a phase. Today is Ashley 1st Birthday. Can’t imagine that exactly one year ago, I gave birth to my little princess. Still remember every minute of it (including the excruciating pain thereafter). Would I go through this again? At the moment, I’m not sure. I still remember the first time we took her out to the mall. We went to Mid Valley when she was about 2.5 months old. Yes, I waited until then to take her out. She didn’t like it when we put her in the stroller so we carried her when she cried a little. Then we put her down again for a while as it was tiring. We continued to do this a few times and in the end, my poor baby threw up all the milk she drank about 2 hours ago. It happened at the Jusco supermarket when I was queing up to pay for the groceries. Hubby was holding her and he had milk all over his hands 🙂 At that time, I really panicked and my mum was nowhere in sight. I didn’t even know what to do so I called my mum on her handphone and asked her to come over right away (mum was at the bakery section). When mum came, we went straight to the changing room and cleaned Ashley. When I think back, I really cannot imagine how silly I was. I just stood there and waited for my mum to take Ashley to the changing room. Of course, now, 1 year later, I am more experienced but I still have a lot to learn. It’s not easy being a parent. However, I enjoy taking care of Ashley. Seeing her grow every day is such a joy.